2016 was a bumpy ride. Lots of news and political happenings world wide. I'm glad to be able to check it off of my list and move forward. Regardless of all the bumps there's always some good to come from it. Personally, we've enjoyed a very full workload this year. Continuing to build our company, expand our capabilities and services. We had some really fun and challenging projects. We did some custom work that ended up at NASA. We made a commemorative adoption day wall art for friends to celebrate everyday that they are a family. We also took on some extremely high volume manufacturing jobs that kept us up into the wee hours of the night. After a couple years of planning, we got married! Many things did not get checked off of the wedding to do list. But many things did and our loved ones were all there to help us to the finish line. It was a very good weekend. The whole wedding thing did make me derail a bit from consistently posting about our happenings. I'll be better about that in the coming year. Our work became available at more stores! We vended in Chicago, Portland and Seattle. Met some amazing fellow vendors and customers at each event. We were unable to keep our reclaimed wood keychains in stock most of the time in 2016. Looking forward, we are excited about some opportunities and adventuring out of even further with our work. New prototypes are already in development and hopefully a few trips out and about. Whatever comes our way in the 2017, we're ready. Thank you all so much for supporting our work, our designs and ultimately our family. We're still recovering from our wedding, all the things that surrounded the wedding and also a big show immediately after that in Chicago. Hello! To all our new friends that are finding us from that Chicago show! I'll have a separate post about that show and the incredible things we saw in Chicago later on this month. One thing to note, is that we currently have our Etsy shop on vacation mode for the rest of the week. I am revamping some old photos and adding some new products to all of our shops. Now on to some wedding pictures! I'll have more detailed DIY wedding posts over on my personal blog, which is more suited for wedding things. Quite honestly, I am still in complete shock that we pulled it all off. We had a rollercoaster of a ride making that event happen. We did everything ourselves with help from friends and family. Our wedding story includes a tree falling down onto a house, thousands of lumpia and a boat filled with beer. We did things our way. We even made use of that downed tree and created a display at our ceremony site. 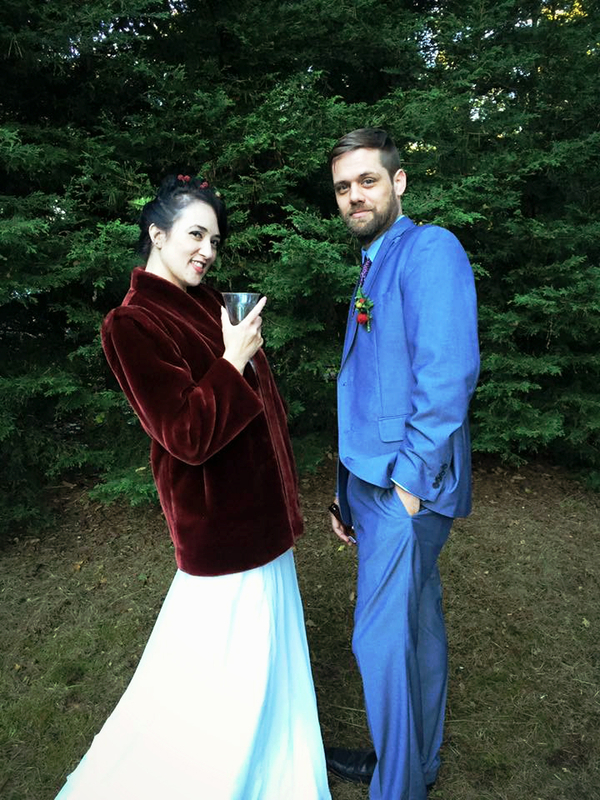 Our ceremony included jokes, NIN, Richard Dawkins and Parks and Rec references and were announced "carbon based lifeform to carbon based lifeform". Everything was very us. Our wedding was very much handmade. It was also an intimate wedding under 70 people. We made our own food, bought our own tents, thrifted our decor, I made my wedding bouquet and boutonnière, John's best friend married us, my mother in law was our photographer, my nieces made the most beautiful wedding cake for us and our kids gave us way to each other and were our wedding party. It was so much fun. We felt so loved and honored to celebrate with ones we hold so close. We gave out some very unique wedding programs and favors of course! Thank you all who have emailed/messaged us congratulations. It has been really awesome to receive those. I've always been a bit different. I grew up in a time when it was still "odd" to be bi-racial, to be raised by a single father and when learning disabilities were mostly misunderstood. All my "oddities" led me to be the strong willed - (often stubborn) person I am today. My father taught me to always ask for what I want, don't be shy about it! John and I met through a mutual friend in 2012. A year of hilariously ridiculous conversations led to 2013 the beginning of our relationship. A relationship with some challenges. We both have children from previous marriages (a situation where you hope that everyone likes each other - we luckily won the lottery on kids) and in 2013, we lived in two states. A many months were spent traveling almost every weekend between Oregon and Washington. Long phone calls and about a million text messages. I had the opportunity to do a show in the Midwest with my (other) business in April of 2014. Since I was going out there, I figured I'd visit my family in Michigan & New York too. Why not invite John along? All of his family lives in one spot and I had met them all, where in high contrast my family must have some gypsy blood in us because live all over the planet. Niagara Falls - New York side. My stepdad's childhood homestead in a suburb of Rochester, NY. He inherited that homestead when his mother passed away. My mom took the plunge and moved from Washington State (her home of 30+ years) out to New York. We did the tourist thing when John & I arrived there. 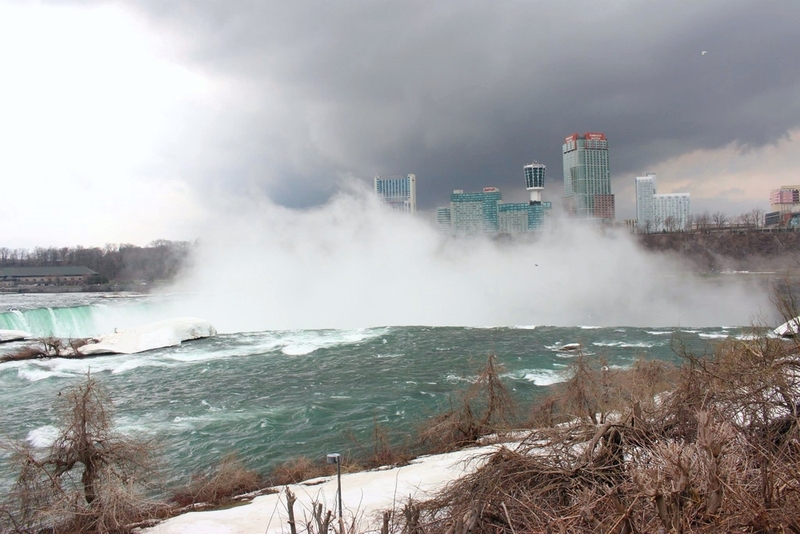 Checked out a few notable spots in that area, the biggest one being Niagara Falls. We happened to be planning on visiting the falls on Earth Day. One of the very first things that I knew about John was that his friends called him a hippie. He had long hair when I met him. BUT if you actually knew John, he's totally not. Where I am actually the "dirty hippie". I thought it would be adding the cherry on top of life we were engaged on Earth Day. John had hinted about marriage/proposing for a while. I figured I beat him to it. Why not? I'm not a "normal" girl, I don't care about a lot things that the world tells a girl she should care about. It seemed perfect to me, because love. We've been engaged today for two years. We chose a long engagement to focus on this company. We didn't start the business off exactly as planned but things have sorted out as they do in life. Later this year we will host probably one of the weirdest weddings ever. I just wanted to share a little bit of the "love" part of the "Lasers and love" on this special day. We're weird, unconventional, interesting and lovers of Earth. Thank you for following us along! There's so much more to come. Happy New Year dear friends! We took some time off at the end of 2015 spending it with family and friends. The holidays were kind to us and I hope they were to you as well. We even got to see a bit of snow. As we're easing on into 2016, we'll be updating our shop with new products and a few updates on some current favorites. 2016 is looking to be a big year for us. We hope to attend/vend at a few choice craft shows locally and nationally. We'll be introducing a big handful of new product lines, while continuing to offer custom services. 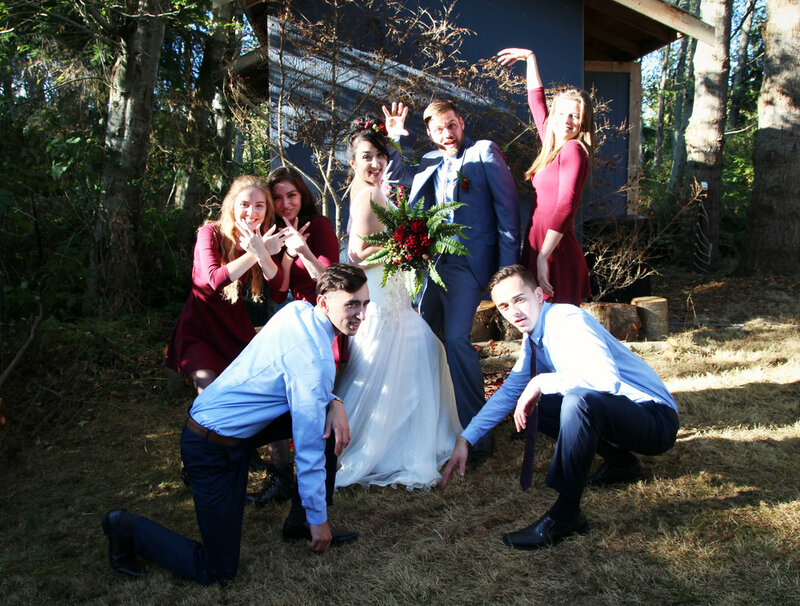 We're coining 2016 The Year of Love and Humor - mostly because we are getting married this year. Also, as I mentioned previously, love and humor never goes out of style. We enjoy things with staying power and hope that our products have what it takes to earn that title. We're also completely ridiculous people and enjoy making ourselves laugh at what we do. We're hoping you'll stick around and follow us along in our journey this year. We've been taking a few days for family time. Out of town visits and moving our eldest boy out as he begins his college adventure. Hopefully you all have been able to squeeze some good times out of the last few weeks of the year. 2015 has been an incredible first full year in business! (We've only been in business for 16 months!) We've learned a lot over the past 12 months. Discovered what products of ours are loved and which ones need some work. We have three big craft shows and one trade show under our belts. We're hoping that there will be many more in 2016. Lastly, we've discovered endless possibilities with our custom manufacturing services. An aspect of our business that wasn't much of a consideration in our original business plan. It has turned out to be our favorite thing to do! Constant fresh ideas coming from an array of companies and individuals. John, our kids and I, all want to say a big thank you to everyone who generally supported us this past year. We truly win in the friends, family and business friends/customers department. Thank you so much! We already have many exciting things up our sleeves for 2016! It's definitely going to be a great and big year for us. I hope you'll keep following us along with our adventure. 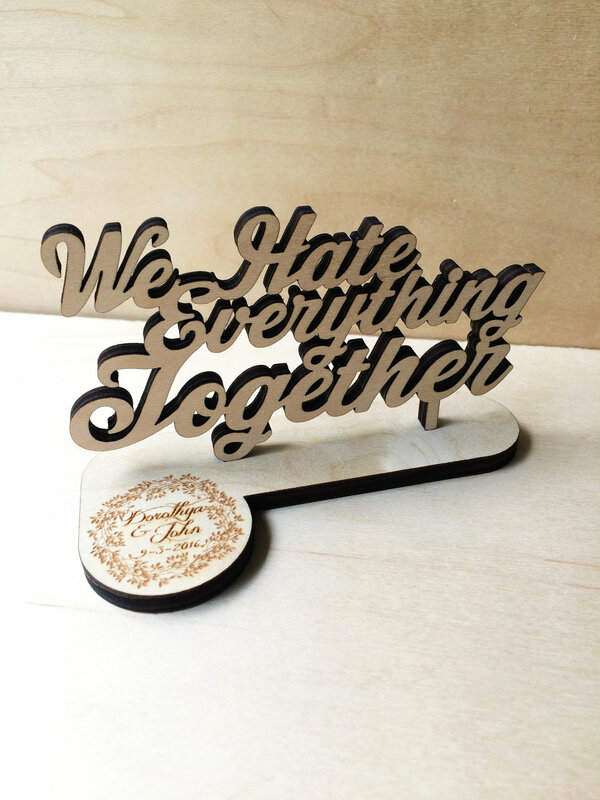 We're asked a lot of questions about our name, process, how does laser cutting work, what can we cut, what's our favorite beers, do we really have 6 kids, the list goes on. So we thought it would be great to create an outlet to answer those questions. Rather than cutting and pasting responses we thought it would be good to actually see us answer them. Follow our YouTube channel to see all of our videos. Last week was my 20 year high school reunion (fun fact: I'm older than John). While I was unable to attend the actual reunion but we did need to do some errands on the island. Even though I've been a mainlander for some time now, I still get a longing to see the sights and hear the sounds of home. Old drive in sign with two remaining marquee letters hanging on. The Shrimp Shack - on the roadside of the North Cascades Highway on Fidalgo Island never disappoints. That's a 1/2lb of fresh calamari in that basket. North Cascades Highway leads to my hometown. Lots of inspiration comes from just being in that area. I've been been much of a city girl so the slightly slower pace suits me. Since our company's inception, we've created quite a few prototypes with elements of inspiration from my home. One of the most striking things in my hometown is the Deception Pass Bridge. Which is currently getting resurfaced, my condolences to those who need to drive off the island in the evenings. The best view of the bridge is from below it in a boat. I won't bother posting a picture of it since there are so many better ones online compared to the ones I have here on my hard drive. The bridge's design is angular and impressive. A prototype that we are continuing to develop is a shelf/stand kit using the bridge's structural design as the inspiration. I've been using one of the small prototype as a candle/jewelry/phone holder. We're fine tuning the designs but will have some kits in time for the holidays. I did stop by my old high school since I was there. (Don't worry I keep up with many life long friends on a regular basis. Some friends I've had since I was 5 years old.) I was a bad kid in high school and like the other bad kids, I smoked across the street from the school. I figured that would be a good place to have my picture taken for reunion's sake. Also, I quit smoking years ago.